More than 150 traditional Vedic Pandits from India and Nepal travelled to Nawalparasi for a 15-day Maha Yagya, which was attended by over 100,000 visitors. It was a very special honor for Lothar Pirc as the chairman of the board of the Foundation for the promotion of Vedic Culture to be a guest speaker representing Dr. Kingsley Brooks. 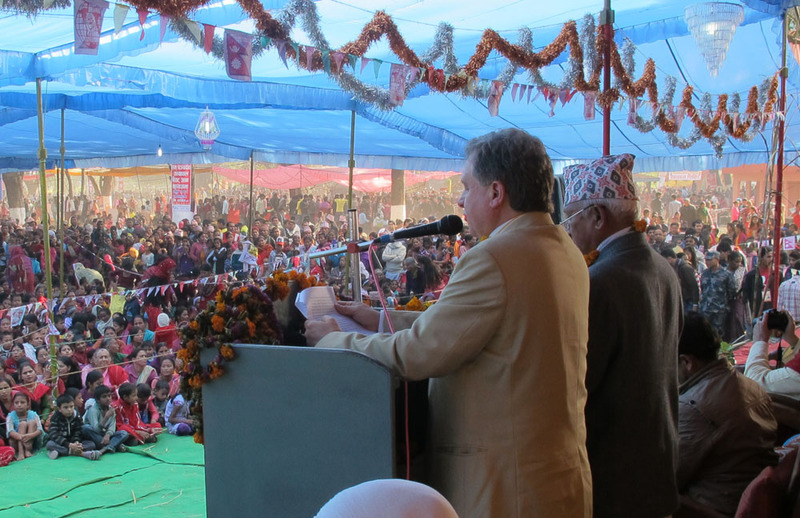 Together with Deepak Baskota, the chairman of the Nepal Maharishi Foundation for Vedic Culture, Lothar gave a speech to more than five thousand visitors of a 15-day Maha Yagya, which was sponsored by the Bramhandiya Dharma Sabha (Cosmic Religious Assembly). The Bramhandiya Dharma Sabha invited over 150 Vedic Pandits from India and Nepal to perform the various aspects of this Maha Yagya. First of all, Lothar praised the assemblage of Vedic Pandits for upholding the Vedic Tradition of India and Nepal. The host country of Nepal, one of the most Vedic countries in the world, is famous for its richness in culture and tradition. Vedic Recitations and the Vedic Performances (Yagyas) as performed by the Vedic Pandits in Nepal are recognized by UNESCO as a significant part of the world’s cultural inheritance. UNESCO has proclaimed the tradition of Vedic recitation as “a masterpiece of the oral and intangible heritage of humanity”. Lothar’s speech provided an opportunity to speak more precisely about the Vedic Technologies of Yoga and Yagya, which have the ability to create peace and harmony in a country and create positive effects from a distance. The revival of the precision and effectiveness of the Vedic Yagyas was credited to the work of His Holiness Maharishi Mahesh Yogi, who through his wisdom and knowledge has applied the transforming power of these Vedic Technologies for the benefit of society. He went on to explain that the essential ingredient of a successful Vedic Performance rests upon the consciousness of the Vedic Pandit himself. The quality of the Pandit is purified and strengthened by the technologies of Yoga (the Transcendental Meditation® program and TM-Sidhi® program, including Yogic Flying) as taught and systematically presented to the world by Maharishi Mahesh Yogi. The audience was also impressed with the progress of the Nepal Maharishi Vedic Foundation in sponsoring the daily Rudra Bhishek Yagya on the grounds of the Pashupatinath Temple in Kathmandu, Nepal, and the plans of the Nepal Maharishi Foundation for Vedic Culture to support the ongoing Yagyas and the Vedic Gurukuls (Schools for Vedic Pandits) throughout Nepal. Following the speech, the senior organizers of the event offered to donate land in the nearby area for the use of a Maharishi Vedic Gurukul. All chairmen of the Nepalese partner foundation were deeply appreciative of the work of Lothar Pirc and the German Foundation for the Promotion of Vedic Culture.